In Asunción, there is a real lack of social programmes to support families in need and educate parents so that they can ensure a better future for their children. Illiteracy still affects almost 30 per cent of the rural population, many of whom migrate to Asunción in search of work. Children in our care grow up with their brothers and sisters in a loving home (photo: D. Benegas). Asunción – or “Nuestra Señora Santa María de la Asunción” in its full name – is the capital city of Paraguay and has a population of around 540,000, making it the country’s largest and most populous city. Over half of the population is under the age of 30. The city is located in the west, near the Argentinian border, on the River Paraguay. It is Paraguay’s economic centre with a growing financial sector. Asunción is very much a divided city: while on one riverbank, there are large family homes with nice gardens, on the other riverside – in the “Bañados” area – unpaved roads and unsafe housing prone to flooding characterise the cityscape. Poverty is a huge problem, with thousands of rural families migrating to the city each year in search of employment. Official government figures show that unemployment is at around seven per cent, but underemployment is as high as 20 per cent on average. Almost 60 per cent of the population stated that they work over 45 hours a week. These figures show that even if people are able to find some employment, it is probably informal in nature and they are not able to make enough money to live off, hence the long hours. The majority of the migrants living in these impoverished urban areas are unable to find work and live in precarious makeshift housing lacking basic infrastructure. Many live off collecting and selling on rubbish. In fact, in Bañados only around one in ten people has formal work. It is common that even the youngest members of a family have to contribute financially, and 13.6 per cent of children between the ages of five and 17 work an average of 35 hours per week. This exposes children to immediate threats such as health hazards, vulnerability to violence, sexual exploitation and psychological problems. But in addition, it has severe effects on a child’s life in the long-term, as child labour interferes with education, therefore jeopardising their chances as adults. Playing in SOS Children's Village Asunción (photo: D. Benegas). SOS Children’s Villages began its work in Asunción in 1982. Today, our social centre here provides a family strengthening programme, which aims to alleviate hardship in the community in a holistic and sustainable manner. Its services include childminding centres that allow working parents or single mothers to leave their children in safe hands while they are out making a living. 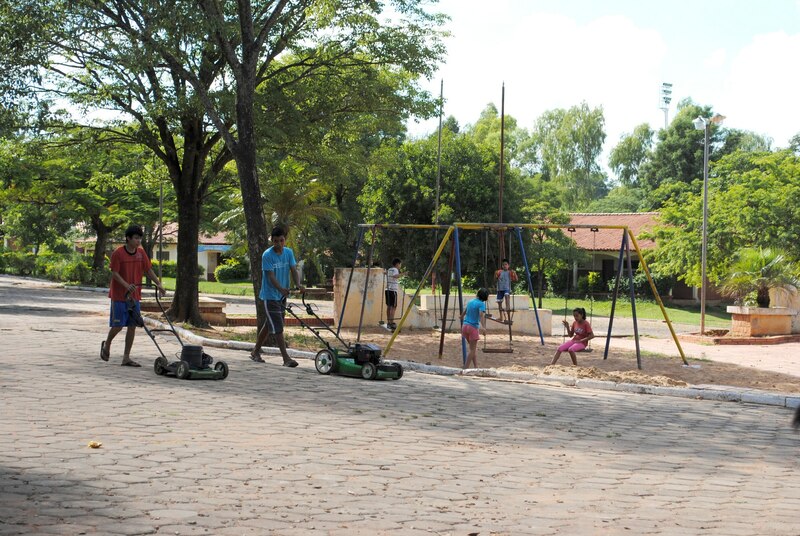 Asunción is also the location of our training centre in Paraguay for SOS mothers and the further education of all SOS staff as well as for internal and external meetings, workshops and camps for young people. For children in Asunción who are no longer able to live with their parents, 16 SOS families can provide a loving home for up to 144 children. In each family, the children live with their brothers and sisters, affectionately cared for by their SOS mother. When young people from the children’s village are ready to leave their family in order to pursue further education or vocational training our SOS Youth Programme makes shared accommodation available to them. With the support of qualified counsellors, the young people learn to take responsibility, plan their future and prepare for independent adult life.